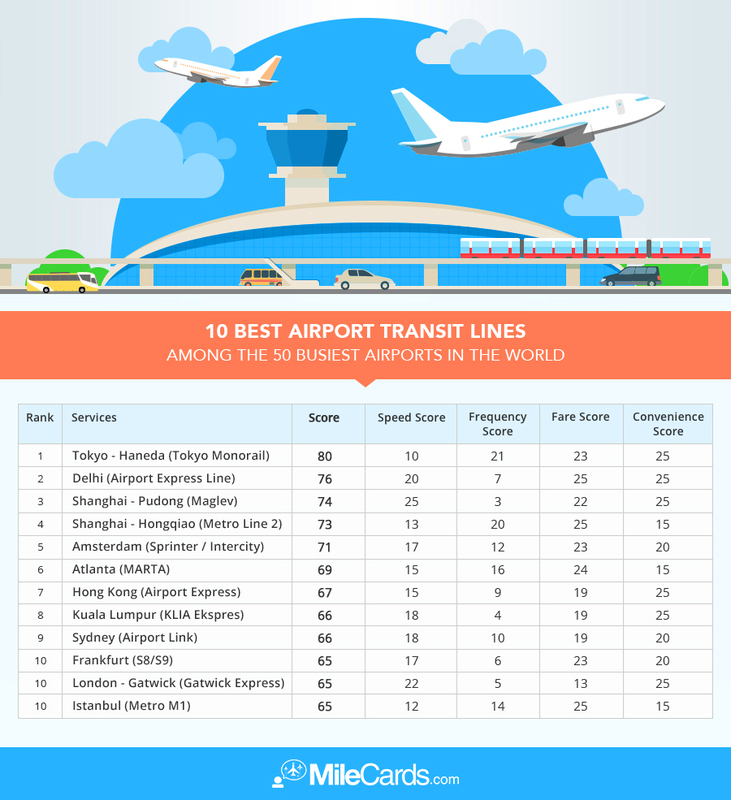 A new report ranks the transit links that connect many of the world’s largest metropolitan areas to their nearest airports. 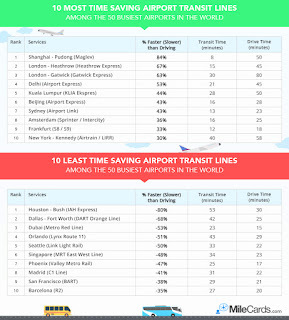 It may not come as a surprise that U.S. airports’ transit links rank fairly low on that list. 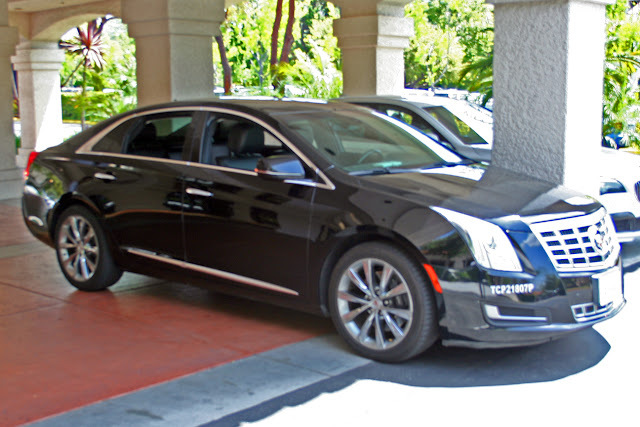 Choosing how to get from one’s home to the nearest airport can be deceivingly complex: taxi or Uber, bus, train, light rail, Underground or subway, drive yourself and pay for parking, or impose on a friend or relative. Determining the best alternative boils down to a combination of time, money and convenience, factors that are not always easily measured. 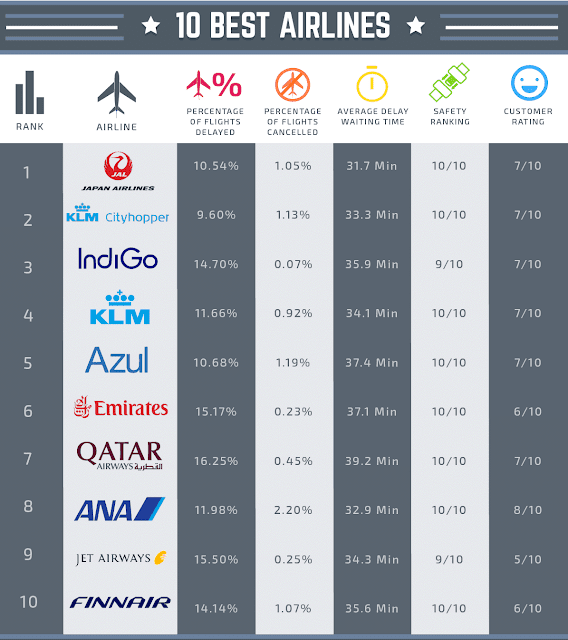 MileCards.com, which presents itself as an unbiased resource for comparing travel-accruing credit cards, commissioned a study that reviewed the range of ways available for travelers to get to the 50 busiest airports globally, as well as the 50 busiest U.S. airports. Those include dedicated systems like London’s Heathrow (LHR) and Gatwick (LGW) Express Trains, as well as public transit including Atlanta’s MARTA system and Seattle’s Link light rail. To rank the transit systems, researchers considered four factors: Time saved vs. driving, cost, frequency and convenience, allotting 25 points to each criteria. Results were then ranked in two categories: Best Overall, and Fastest. “It came as no surprise that Asian airports secured four of the world’s top five spots, given the area’s ongoing investment in transportation infrastructure and the fact that several of its cities are large and traffic-congested,” the report’s authors said, noting that U.S. cities and their airports did not make the top five. 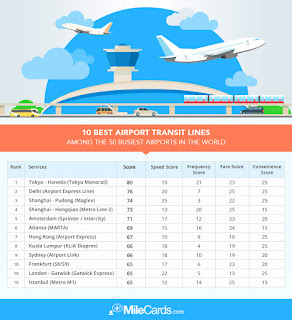 The top spot worldwide went to the Tokyo monorail that connects Tokyo to Haneda Airport (HND), followed by the Airport Express Line that connects Delhi, India to Indira Gandhi International Airport (DEL), the Maglev train that connects Shanghai to Pudong International Airport (PVG), the No. 2 Metro Line that connects Shanghai to Hongqiao International Airport (SHA), and the Intercity Sprinter that connects Amsterdam to Schiphol International Airport (AMS). The highest-ranked transportation link to a U.S. airport was Atlanta’s MARTA line that connects to Hartsfield-Atlanta International Airport (ATL). It ranked No. 6 in the world, and was the only U.S. link in the worldwide Top 10. After Atlanta, top U.S. transit links include the Chicago Transit Authority’s Orange Line that connects to Midway Airport (MDW), the CTA Blue Line that connects to O’Hare International (ORD), Denver’s University of Colorado A Line that connects to Denver International (DEN), and the Airtrain/Long Island Rail Road that connects New York City to John F. Kennedy International (JFK). As a frequent traveler to the District of Columbia, I found it somewhat surprising that the city’s Metrorail, which serves Ronald Reagan National Airport (DCA) ranked No. 6 in the U.S. However, speed is the single area where Metrorail ranks worse than No. 1 MARTA; on fare, frequency and convenience, D.C.'s Metro is equal to or higher than MARTA. The study also quantified the transit systems that saved the most and the least time over driving. International systems saved the most time, with the Maglev train to PDG coming in 84 percent faster than driving followed by London’s Heathrow and Gatwick Express trains, as 67 percent and 63 percent faster, respectively. Delhi’s Airport Express and Kuala Lumpur International’s (KUL) KLIA Ekspress rounded out the top five, at respective savings of 53 percent and 44 percent. 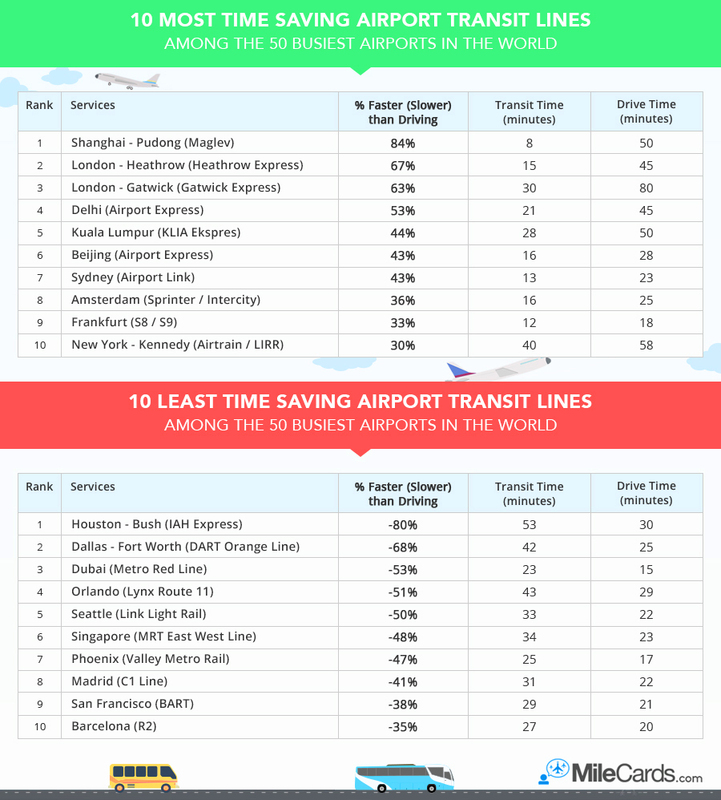 In the U.S., New York’s Airtrain/LIRR saved the most time - 30 percent over driving – followed by Atlanta’s MARTA, at 26 percent faster. The CTA Orange Line to MDW saved 25 percent, Los Angeles International’s (LAX) Flyaway bus and the Bay Area Rapid Transit (BART) train to Oakland International (OAK) each saved a mere eight percent. Around the world as well as in the U.S., some systems actually took longer than driving. Among the lines connecting to the 50 busiest airports in the world, Houston’s IAH Express, which connects to George Bush Intercontinental Airport, was 80 percent slower than driving while the DART Orange Line connecting to Dallas-Ft. Worth International Airport (DFW) was 68 percent slower than driving. 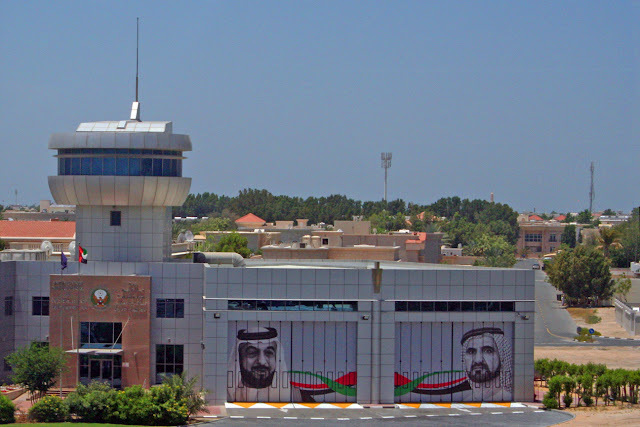 The Metro Red Line connecting Dubai International Airport (DXB) to the city was 53 percent slower than driving, while Orlando’s Lynx Route 11 connecting to Orlando International (MCO) and Seattle’s Link light rail connection to Seattle-Tacoma International (SEA) were 51 and 50 percent slower than driving. Among U.S. airports that were not among the 50 busiest, the results were even more dismal. According to the study, taking the VTA Route 10 Light Rail to Silicon Valley’s Mineta San Jose International Airport (SJC) is 216 percent slower than driving, Detroit’s SMART Route 125 to Detroit Metropolitan (DTW) 181 percent slower, and Route 19 to Honolulu International (HNL) 155 percent slower. Study sponsors said the idea for the study came from President Trump's promises to invest in infrastructure, according to the company. “We at MileCards are hoping infrastructure dollars find their way into the nation's lagging airport transit systems which perform poorly against global airports, especially in Asia,” the company said in a statement accompanying the study.